Thanks in advance for the support. Our organization set up expensify independently of our accountant but later found out that he was already ExpensifyApproved. I can see how to add him as a Domain Admin but currently he is unable to view our policy or review our team's expense reports. From the documentation I read it seems as though one of the benefits of him being ExpensifyApproved is that he can be a member of our policy and support us with reports and approvals without us being charged for his seat, but I'm not sure how to proceed. Am I to send him an invitation to our policy using his company email address (different than ours)? If not, can you help me to understand the intended relationship between our two types of accounts? If there is clear documentation for this that I have just missed I'm open to links too as I wasn't able to track it down. Hi @bashomosko, you're correct. The only way to directly invite them to the Policy is via the Settings > Policies > Group > [Policy Name] > People > Policy Members table, using the Invite User links. As many users as you like can be listed in this table. As long as they're not active during the month, they won't be included in your billing. Basically, if they take an action on a report which is currently linked to a policy you're the billing owner for, they'll be classed as active for the month. If not, they won't! Note: This "activity" includes actions Concierge does on their behalf. 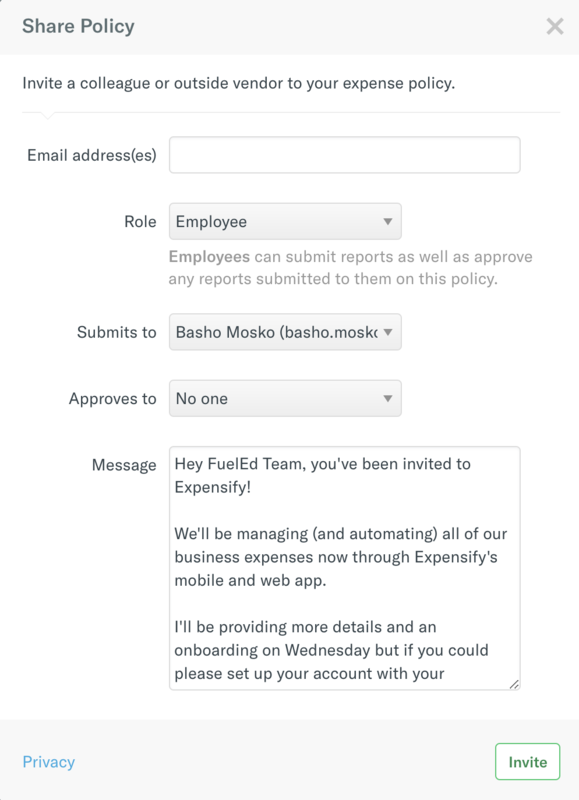 So if they don't log-in to Expensify during a month, but Concierge adds some imported transactions to a report on their behalf during the month, they will be classed as active. You should be able to invite him as a Policy Admin, and he also should have a special code you can add to your Billing settings. This is what will bring the accounts together! Feel free to come back to me if you have any further queries about this. Thanks @RachCHopkins - so I would use the Invite function in the People section of our Policy (see below)? Will we be charged for his seat even if he isn't submitting reports? And there is no way to directly add him - it has to go through the invite process? If it's our accountant that is doing the final approvals of the reports and then exporting over to Quickbooks, does that count as "activity"? What if they are making comments on the report asking for additional information or such? At the end of the day it's $9/month so not a huge deal either way but I want to make sure I'm totally clear about how it all works. No surprises, ya know?